A ransomware attack that encrypts your files and leaves you without access to them can pose an enormous threat to your business. And the sooner a ransomware attack is detected, the more effective damage mitigation will be. You'll use both the Security page, described below, and the Ransomware Incident Detail page to monitor and manage the entire process from initial incident detection through quarantine, file reversion, closure, and removal of the affected device(s) from quarantine. This feature is designed to contain the ransomware attack and to keep it from spreading via the sync process. If you have a confirmed ransomware incident, we recommend that you revert the affected files, then recycle the device via Workplace. 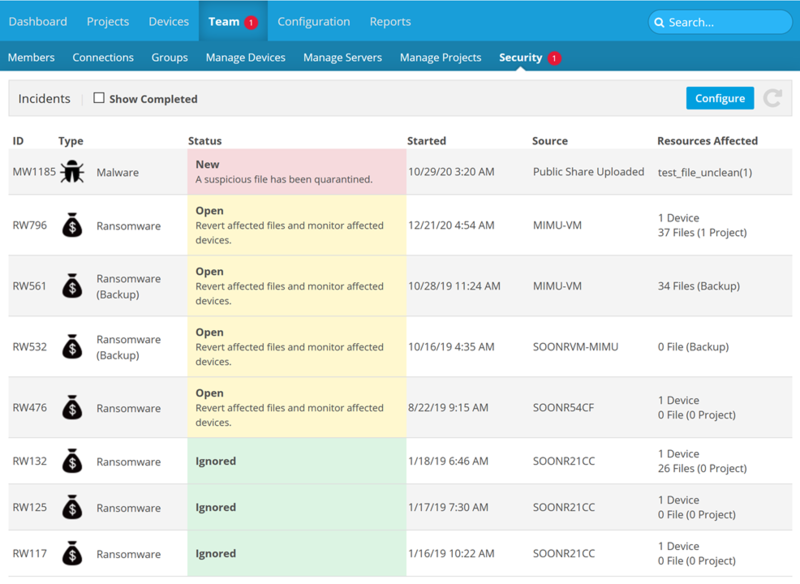 On the Security page, you'll be able to configure security monitoring, review security incidents and the devices they have affected, and track devices that have been exempted from monitoring. ID The system-generated identification code for the specific incident. The first two characters indicate the type of incident. This ID ensures clear communication when discussing incidents. Type The classification of the incident. The icon helps identify the type at a glance. Started The time at which Workplace first detected suspicious activity. Source The name of the quarantined device. Resources Affected The number of devices, files, and projects affected by the incident. DeviceA device is computing device that has access to Autotask Workplace, including both mobile devices and computers. The name and operating system of the excluded device. Owner The user associated with the excluded device. Excluded The time at which the device was excluded from security monitoring. Excluded By The user who excluded the device from security monitoring. Click the Configure button. This will open the configuration pane. Use the toggle to enable or disable a security feature. Click the incident you wish to view. This will open the Ransomware Incident Detail page for that item.